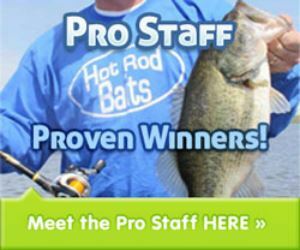 Tubes work well year-round, but this time of year when the bass are transitioning to fall areas they may be at their best! 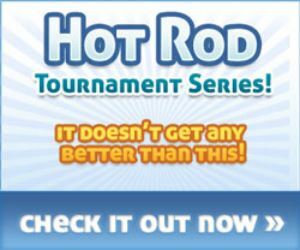 Get your supply of tubes NOW before the fall fishing heat up is here. Shown: The Christmas Tree tube with a keeper Mississippi River bass. 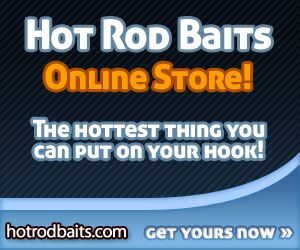 Travis Loving and Dave Tubandt become the Hot Rod Baits Bass Series Team of the Year today by besting Ken Lunsford and Jimmy Gaard by 4 points. Loving and Tubandt started the year with a 5th place finish at 12-Mile Lake, a win at Pool 10 of the Mississppi River, and finished the year with an 8th place finish to wrap up Team of the Year honors, the hardware and the $500 bonus! CONGRATULATIONS! Tom Cranston and David Markham won by a half of a pound today Lake Belva Deer. On a day that 16 out of 19 teams brought in 5 or more keepers, it took exactly 15.00 pounds to win today. Second place was Jeremy and Jon King with 14.50 pounds. Third place went to Ken Lunsford and Jim Wiegand, they also caught the big bass of the event at 4.91#. Randy Ellison and Savanna Lawson took 4th place with 13.35 pounds and rounding out the top 5 was Randy Hileman and Brett Nossaman with 12.97 pounds. Congratulations to all the anglers who were able to enjoy a beautiful day on Lake Belva Deer. PRO-STAFFER Kary Ray finishes 4th!!! Here's a couple bass from Saturday's FLW-BFL Tournament out of LaCrosse, Wisconsin. Travis Loving and Dave Tubandt continued their quest to the Team of the Year title by figuring out some tough Pool 10 largemouth bass. Travis and Dave fished in Pool 10 all day to gather their limit of 6 bass for 13.78 pounds. They gathered up 26 Team of the Year points and take the lead for the year end title. The father son team of Cole and Rudy Herb took home 2nd place with a mixed bag of smallmouth and Largemouth bass that weighed 12.89 pounds. That also vaulted them up to 2nd place in the Team of the Year race. Third place went to Todd Reed and Brian Bowles with 5 keepers for 9.26 pounds, fourth place was Steve and Jerrid Tolly with 8.92 pounds and fifth place went to Nate Maher and Aaron Clark with 7.81 pounds. Big bass of the event was a smallmouth caught by Jeremy King, it weighed 3.47 pounds. Complete results and standings can be found on HERE. Hale's Guide Service is the place to call if you want the oppportunity to fish the Okoboji Lakes. The long time custumer sent in a great picture of one of his clients catching largemouth at West Lake Okoboji in Iowa. Nate Levan was catching smallmouth and largemouth last week in the crystal clear waters of Okoboji. Nate, showing a great largemouth caught on the Hot Rod Baits Sticks, Jelly was the color of the day once again. 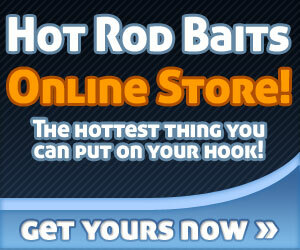 As the water warms up, the wacky rig presentation with our stick baits are hard to beat, get yours today!